Mark Coleman explores the paradox of continuing to open our hearts to the beauty of the natural world while also feeling the deep pain of losing what we love. As I sit by the ocean, I can revel in the silky surface of the water, the light catching the crest of waves, and be mesmerized by its restless beauty and vast power. Yet I also can’t help thinking of the creatures that lie within it: the diminishing shoals of tuna and dwindling populations of porpoises. Whenever my heart feels torn in this way, I remember that where we habitually place our heart and mind becomes our natural inclination. What we focus on determines to some degree our sense of well-being. We can’t ignore the ecological crisis. We are here because society has refused to look squarely at this complex problem. However, does it serve the greater good to dwell only on the catalog of data about climate change? Such single-pointed focus can lead to despair, hopelessness, and worse. On my walk I can dwell on the smoke, the acrid smell, the diminished visibility, and the destruction those fires bring. Or I can shift my attention to what is not burning up. To the Indian paintbrush flowers at my feet on my walk, or to the wave of pelicans who fly in exquisite formation along the coast. I can take in the elegant trees that reach their limbs skyward and the beautiful eucalyptus bark that peels like skin, while their leaves cast a dreamy, shadowy light upon the lush undergrowth. Mindfulness teachings point us to meet the present moment as it is: We behold both the beauty of nature and the devastation that is occurring. We see the folly of overly romanticizing the past or drowning in doomsday scenarios of what’s to come. We hold predictions about the future lightly, however certain they’ll appear, as we can never know for sure what may unfold. The question I hear from many people is: How do we hold the pain of the earth at this time? My answer is simply to grieve. To let yourself feel the depth of the pain and let the tears flow. In learning the power of inclining our mind, we can also turn our attention to the tremendous number of constructive solutions that millions of people around the planet are working on. Organizations around the world are figuring out how to remove plastics from the ocean, draw carbon from the air, restore habitat for tigers in Nepal, and clean up the Ganges river. The list of businesses, municipalities, and nonprofits crafting creative solutions to the climate crisis is vast and increases every day. These times require our mindfulness practice to hold a wide view. It asks that we hold the harsh reality of the eco-crisis, the beauty of what is still here and thriving, and simultaneously the uprising of ordinary people working all over the planet to steward, protect, and preserve the earth in sustainable ways. I have walked through scorched forests. I can look at the blackened trunks and feel a tender grief. And I can also focus on the emerald green shoots that rise out of the ashes. Both are true. Both demand our attention. To be awake today is to learn how to hold paradox in your mind and to dwell in ambiguity. Indeed, the question I hear from many people is: How do we hold the pain of the earth at this time? My answer is simply to grieve. To let yourself feel the depth of the pain and let the tears flow. Allowing grief to move through allows movement and a responsiveness to rise out of those tear-stained ashes. It helps melt the frozen numbness that thwarts effective action. This is an excerpt from the feature Grieving For and Loving Our Planet. 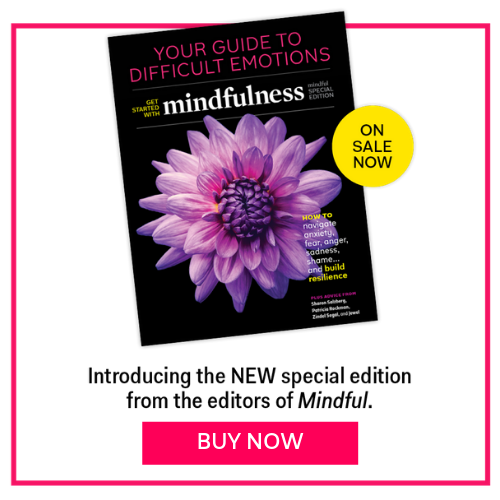 Read the whole story in the April issue of Mindful Magazine.